Registrations Service have recently employed their second apprentice as their first moves onto new adventures. Apprenticeships are work-based training programmes leading to a nationally recognised qualification for the apprentice to help their own career development. Paul Wadsworth, Registration Officer says, “Employing a young Apprentice lifted the spirits of the whole service. The staff wanted to help, support and watch the young person grow as a professional and as a person. Terri Challis, our first Apprentice said “The programme allowed me to gain workplace experience and personal confidence. It also gave me the time to make positive choices about my future with a clear direction and purpose.” After working within the service as a registrar over the summer Terri is off to study English Language and Linguistics at The University of Roehampton. 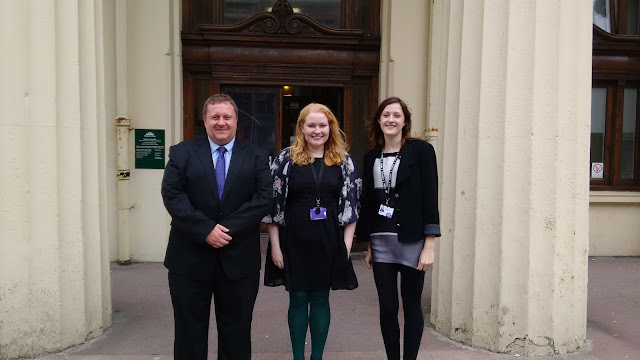 Hannah Cydnie is the councils new registrar apprentice studying towards Level 2 in Customer Services. Hannah says, “I am really enjoying my apprenticeship at the Register Office. Everyone is very supportive at work especially Terri. She helped me when I started and continued until she left. She helped me learn the job and helped me with college work. She was a brilliant member of the team and a great mentor to me. I am now an apprentice ambassador. I wanted to do this role to tell other people about apprenticeships and give them advice. I have spoken at events at Varndean College and the Job Centre. I enjoy being an ambassador to share my experience and information about apprenticeships”.